Our best honeymoon suites are perfect Valentine's Day gifts. Nothing says "I love you!" more that a confirmed travel itinerary to an all inclusive resort in the Caribbean. For Valentines Day 2016, we've picked out some amazing suites for you to consider. Check out our Suite Heart deals that started February 12th. We also encourage you to visit our pinterest board, where we show you even more! Let's start out with the suite that has us the most excited. Coming soon to Sandals Royal Caribbean in Montego Bay, Jamaica, over the water suites with glass floors and private infinity pools. We also love their swim up butler suites. Secrets Wild Orchid (also in Montego Bay) has really nice modern swim up suites, master suites and presidential suites. In Antigua, you can find incredible rooms at many of the resorts. 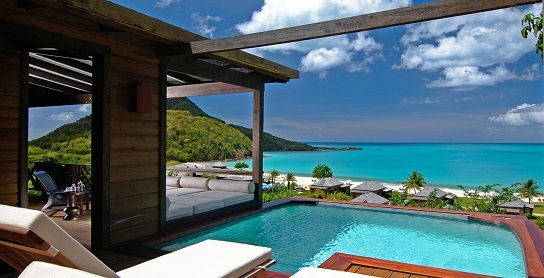 Our favorite is the plunge pool suite at Hermitage Bay. We also love the rondoval suites at Sandals Grande Antigua and the waterfront suites at Cocobay Resort. In St Lucia, a very high percentage of resorts have suites with private pools. 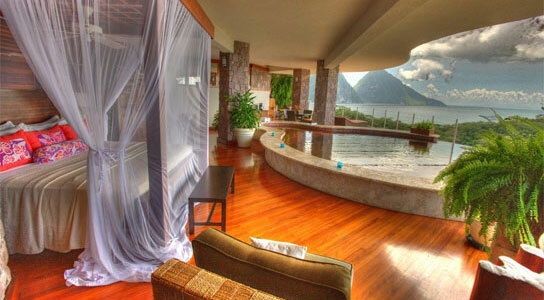 We have to go with any of the suites at Jade Mountain, which are simply sensational. Really cool suites can also be found at Sandals Grande St Lucian, Sandal Regency La Toc, Sugar Beach, Calabash Cove, Ladera, Cap Maison, Ti Kaye and Windjammer Landing. The new skypool suites at Sandals LaSource Grenada may be their coolest suite yet, well until the over the water bungalows open. This resort also has millionaire suites and rondoval suites with private pools. In Cancun and the Riviera Maya, we are also excited to have overwater bungalow suites coming to one of the best beaches in the world Playa Maroma. El Dorado Maroma plans to have the suites ready by September of 2016. El Dorado Casitas Royale already has some of your favorite suites. The casita suites come in several varieties, but all have double jacuzzis and roofless private showers (aguas del amor). Also very popular are the presidential suites at Secrets Playa Mujeres, the rooftop jacuzzi suites at Excellence Riviera Cancun and Playa and the honeymoon villa suites (along with oceanfront suites and presidential suites) at Iberostar Grand Paraiso.